Irish Ferries is a division of the Irish Continental Group (ICG) plc, an Irish shipping and transport group. The company operates passenger and freight routes between Ireland, the United Kingdom and Continental Europe. Irish Continental Line was formed in 1973 as a joint venture between Irish Shipping Limited, Fearnley & Eger and the Swedish company Lion Ferry. It originally operated on the Rosslare–Le Havre route. Irish Shipping Ltd went into liquidation in 1984 and Irish Continental Line was sold off in a management buyout and emerged as the Irish Continental Group. In 1992 the Irish Continental Group took over the British and Irish Steam Packet Company Limited, a nationalised company which traded under the name B&I Line which operated ferry services between Dublin and Holyhead and between Rosslare and Pembroke Dock. 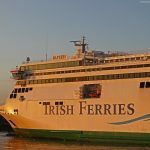 In 1995 the trading name of the B&I Line and ICG’s own ferry services were changed to Irish Ferries.